There's a hidden Leonardo da Vinci in them there walls. The place has been renovated so many times, it's surprising more lost treasures haven't been found in the walls. Let alone that any day someone's likely to uncover the location of da Vinci's lost fresco masterpiece depicting the Battle of Anghiari. It's supposed to be somewhere along the walls of the Palace's Hall of Five Hundred. There was even a companion piece in the hall by none other than Michelangelo. But then Giorgio Vasari was hired to update the room's dated digs and both frescoes were lost. There's preparatory drawings and copies at least of the the da Vinci floating about today, but no one's been able to find the originals as yet. The name translates to Old Palace, and for good reason. Construction started in 1299 on the spot of the Uberti family's razed mansion. Florence was a dangerous place in the 14th century. A couple ruling families had a Sharks and Jets level feud going on for years. Except instead of elaborate musical numbers, fights were settled with sword on sword action followed by, at best, getting exiled. The Ubertis got exiled, and all the stuff they left behind was either taken or destroyed. The ruling party decided to show the town that dissent wouldn't be tolerated in the wake of the Uberti exit by putting a palace housing the new Florentine government where the deposed family's ancestral mansion once stood. "Florentine government" was a pretty fluid term until relatively recently. As a byproduct, construction on the Palazzo Vecchio took forever. Almost 300 years from start to finish. After the first stone went in the earth, most of the building (including the famed 300 foot tower) was put up in a hurry. But new governments wanted revisions to the remaining bits and dragged on the finishing touches for decades. The building still functions as the Florentine town hall, so art-minded folk like you and me aren't allowed into certain rooms when the politicians are getting their Frank Underwood-groove on. Still, Florence was the center of all things art in Europe for hundreds of years. You could walk around the building for days soaking in all the art and be pretty happy. The Palazzo Vecchio (Italian pronunciation: [paˈlattso ˈvɛkkjo] "Old Palace") is the town hall of Florence, Italy. It overlooks the Piazza della Signoria with its copy of Michelangelo's David statue as well as the gallery of statues in the adjacent Loggia dei Lanzi. 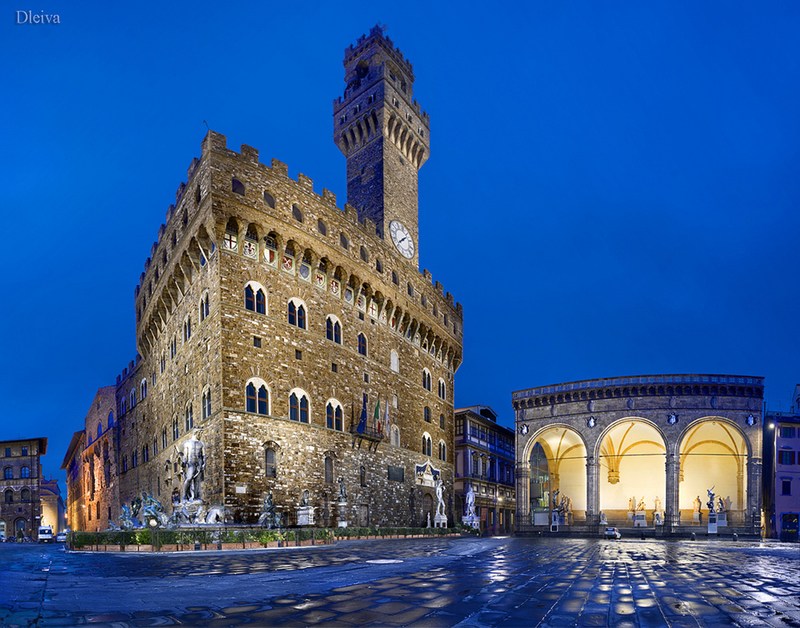 Check out the full Wikipedia article about Palazzo Vecchio.